It's too hot to cook, and that's a fact. You may scoff at the notion that 90+ degrees is an extreme temperature, but in Seattle that's heatwave territory. We melt, okay maybe not melt, but we whine about that kind of heat, especially when it come with rain and humidity. Cold drinks, fresh fruit and lots of salads take the place of home cooking when it's this hot. Salads are terrific summer fare, but some days I really crave red meat. I'm not talking about a huge steak or even a burger, though both of those choices are incredibly tasty treats. No, I want just a bit of tender, flavorful beef. This salad is a perfect way to meet that craving and still enjoy a light summer meal. 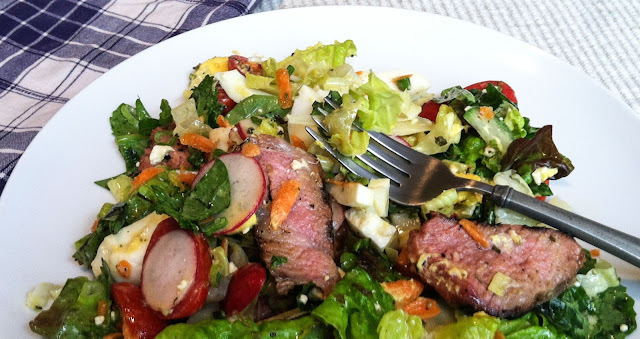 Fire up the grill and keep the cooking heat outside, or pull a piece of already cooked beef from the fridge; this salad comes together in minutes and packs a hefty flavor punch. Toss the greens with the herbs, onion, radish, carrots, cucumber, chili and sprouts if you're using them. In a bowl, combine all remaining ingredients (lime juice through black pepper) for a dressing; taste and adjust seasonings. Add 1 scant tablespoon water if needed for balance. Note: the dressing is supposed to be rather thin. Use up to half of this mixture to toss with the greens, but don't drown them. Place the greens on a platter or in a wide, shallow bowl. Slice the beef very thin, reserving any juices to combine with the remaining dressing in a small bowl. Drop the meat slices into the bowl with the remaining dressing, tossing gently to coat each slice. Drain any excess dressing from each slice and arrange the beef over the salad. You could drizzle some remaining dressing over all, if the salad looks dry, but that's not usually required. Top with sesame seeds if you like and serve immediately.